Abrasive Blast Room - Model: RAM Blast Room - Controlled performance with multi-media flexibility. Boeing Company Blast Room for Stripping Aircraft Components. Note Dense Particle Separator & Sweep-in Media Recovery. When you order one of our modular powerhouses, you get an easy to erect, easy to move rugged enclosure where you can blast with starch and plastic media as well as a multitude of other media. Safely, efficiently and cost-effectively. Starch, plastic, and abrasive media blast operations require a controlled environment. A safe, self-contained and highly productive multi-media blast room that does not pose a health threat to workers or a toxic hazard to the environment as is caused by liquid chemical paint stripping. Nor does it contaminate the factory, hangar or workplace with noise and dust. A room with generous lighting and ventilation for maximum Operator comfort and optimum work performance. Where media is cost effectively reclaimed and reused, not wasted as it is by other systems. Pauli Systems’ Reclaimable Abrasive Machine (RAM™) Blast Rooms give you all this plus a whole lot of additional built-in features. Just look at our long list of standard features on the RAM Blast Room features below. • State-of-the-art performance in plastic, starch and multi-media use. • A cost effective blast system that recovers and reuses media. • Superb ventilation, lighting, safety and environmental benefits that increase productivity. • Construction and reliability standards which exceed strict US military specifications. • Peerless quality assurance which exceeds US military specifications. • Comprehensive manuals for assembly, operation, troubleshooting and parts support. The performance advantages found in the RAM Abrasive Blast Room have roots in the most demanding conditions - dry media blasting with starch and plastic. In designing our media blasting room, we’ve built-in new and advanced engineering techniques like straight through media valves for non pulsing media flow. Dual control variable particle size reclaimer. Media aeration. Brilliant lighting. And 60 degree angles on all hoppers, engineering which translates into enhanced power and smooth, responsive performance. Qualities that are every bit as essential to Operators blasting with conventional abrasives as they are to Operators using starch and plastic media. You can reuse media over and over because your blast room is equipped with a RAM System, the world’s most preferred blast and reclaim system. RAM uses a pneumatic conveying system to carry spent media to a four stage recovery and reclaim process: a cyclone centrifuge, dual adjustable air wash, magnetic separator and a vibratory screen. These combine to separate dust, debris and contaminants from reusable media. In addition, a dense particle separator option, the DPS 3000, is available at extra cost to meet aircraft manufacturer and military specifications for media cleanliness in critical applications. No other blast rooms offer such brilliant illumination. Exceeding the highest military specifications for blast room lighting, our rooms enable Operators to work more productively on routine as well as detailed jobs. 120 to 150 footcandle lighting level in midroom, while blasting with plastic and starch media, provides exceptional light for exceptional performance. Results of USAF testing. Documentation available. Designed with advanced media flow engineering principles, RAM Abrasive Blast Rooms have roots in high performance starch and plastic media blasting. Engineering which provides smooth, responsive plastic and starch media blasting in addition to a new level of conventional abrasive blasting performance that Operators will find outstanding. That’s why you can use aluminum oxide, glass beads, starch, plastic and virtually any blasting media with excellent results. Never use Pauli Systems equipment and/or parts with sand. 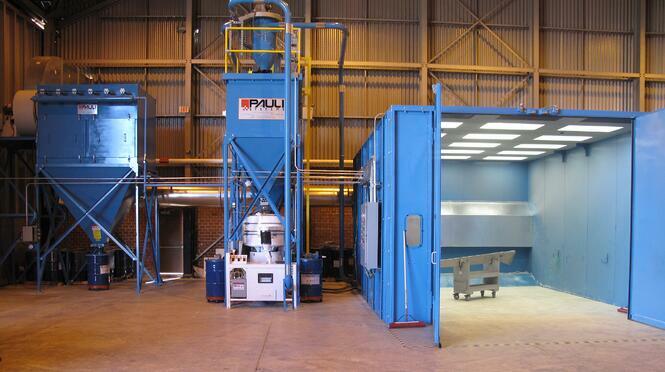 The US Air Force requested two blast room systems – conventional abrasive and plastic media. A single, high-performance multi-media blast room was engineered to exceed all specifications. We won the contract and created our first New Generation Multi-Media Blast Room. Because of this state-of- the-art performance the USAF ordered over 150 rooms. Lo-Pro Feathertouch, our remote blast control, is faster, more reliable, and more convenient than any other blast controller. The compact design enables exceptional blast control for the most sensitive operation. Even in its open position as shown in the photograph, the Lo-Pro Feather-touch, combined with our extra flexible blast hose, gives Operators the smallest, most comfortable and most productive ‘handful’ in the industry. A continuous rush of air sweeps through the Abrasive Blast Room and makes working on detailed parts a breeze. In fact, government tests proved our most popular rooms’ airflow average is far in excess of our nominal specifications of 67-70 feet per minute (20.4-21.3 m/min). Dust laden air is carried to a dust collector filter of cartridge design. The dust collector is a 100% duty cycle unit with cartridge cleaning via reverse air jet pulses activated automatically by a solid state controller. Rugged, reliable, and revolutionary, RAM is specifically designed to efficiently blast, recover and reclaim plastic and starch media and provide outstanding performance with conventional abrasive media. We powered-up our RAM Abrasive Blast Room with AccuFlow technology to give you a high production environment that surpasses anything in the industry. AccuFlow’s computerized media control technology enables smooth, repeatable media flow that your Blast Operators will find remarkable - and quality of work you’ll find outstanding. A Smart Panel control station on the Abrasive Blast Room exterior wall is the watchdog for the unit’s key functions - dust collector blower, door interlocks, recovery booster blower, and room lights. Status lights show function ‘on’ and ‘off’ conditions. To maximize Operator safety, the panel includes a carbon monoxide monitor, alarm, display meter and 3 status lights. The DPS 3000 allows you to separate and remove dense particles from plastic and starch blast media to meet US Military and aircraft OEM specifications for media cleanliness. The system separates dense particles such as sand, metallic particles, and other dense debris and drops them into a collection bin. Thoroughly trained Operators not only do work properly and without damage but do it in less time than untrained operators. That’s why Pauli Systems offers the highly respected Total Technology Transfer training and certification program. Students have classroom instruction, written exams and hands-on experience enabling them to pass rigid certification requirements. Training can be conducted on location. offers a complete active floor that recovers media while blasting. 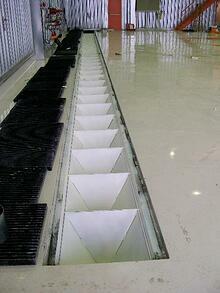 Each floor trough is emptied sequentially by a Pauli Systems' designed indexing selector unit. Automatic recovery frees the operator from sweeping and reduces cleanup and media recovery man-hours. uses a single trough, normally placed in the center of the floor, into which the Operator sweeps spent media. This model can be fitted with two or more troughs to fit your application. is the most economical and easy to relocate. Simple to install and dismantle, it uses a revolutionary hopper that allows easy sweep-in recovery-without the need to cut into an existing floor. is perfect for steel and other metal media. It automatically recovers media while blasting, frees the operator from sweeping and reduces clean-up time. The Operator brings the workpiece into the room through the large convenient double doors. Then wearing protective clothing including an approved blasting hood supplied with approved respirable air, the Operator activates the process by selecting safety button off and depressing the lever of the Feathertouch remote control. The process will not start unless the Operator has shut all doors and turned on the key functions. Dry paint stripping involves the Operator holding a nozzle and directing its low-pressure stream of media at a workpiece until its coating or contaminants are stripped away by impact and abrasion. Throughout the process, a powerful ventilator pulls a continuous stream of air through the room, removing airborne dust. The Operator’s job is made easier and safer by the intense illumination that floods the work area. After the stripping is over - or simultaneously with it, depending upon the blast room floor model - a pneumatic conveying system carries the spent media to the cyclone centrifuge, dual adjustable air wash, vibratory screen and magnetic separator which cleans the media and returns it to the system for reuse. The reclaimer discards spent media and debris in a dust collector and upon vibratory screens. • Multi-media blast room engineered for starch, plastic and conventional media because of multi-media capability. • 12 gauge steel walls, 14 gauge ceiling. Other gauges available. • Brilliant ceiling lights safely separated from enclosed interior enable light changes from outside. • Full size double doors for easy workpiece entry. Drive-through room available. • Man door with window. • OSHA approved interlocks on all doors stop blasting when door is opened. Blasting interlocks also on ventilation blower and breathing air CO level. Recovery and reclaim blower interlocked to ventilation blower. • NIOSH approved Operator blast helmet and breathing air hose. • Breathing air filter. (does not remove carbon dioxide). • Carbon monoxide monitor, alarm, display meter and control panel with 3 status lights for breathing air protection. Interlocked to stop blasting when activated. Government approved respirable air must be supplied to this system. • 24 cubic foot (680 liters) storage hopper and pressure vessel (combined) for extended blast time. • Control panel for room lighting, dust collector and recovery booster blowers, and status lights. Includes motor starters for both blowers. • Low Profile media recovery hopper. • Filtered roof air inlet. • 60 degree (from horizontal) bottoms on pressure vessels, floor hoppers and dust collectors for complete media discharge. • Visual level indicators in media storage hopper. • Fluidized bed in lower pressure vessel for smooth even media flow. • Metering valve with exclusive straight through vertical discharge from pressure vessel into conveying air stream without change of direction. Gives smooth, non-pulsing media flow. • Simple, easy clean out port in media metering valve. No tools required. • Full recovery and reclaim cyclone centrifuge and air wash system with dual independent adjustable dust separation controls for volume and velocity. • Continuous duty, high-performance cartridge dust collector with automatic reverse pulse cleaning activated by a solid state controller. • Water sprinklers for fire protection. • High efficiency blowers with TEFC motors. • Super Flex blast hose for Operator ease. • Lo Pro Feathertouch blast control. • 1,000 lb per sq ft (5,000 kg/m²) floor load capacity (full floor and partial floor), evenly distributed. • 2 Operator package: 2 RAM blast generators, complete with hoses, nozzles, controls and 2 sets of Operator protective gear. • 50 Hz, 3 phase, 415 v or 380 v electrical system. • Electrical system to customer’s requirements. • Additional 5 foot (1.5 m) standard modules for additional room length. • Material handling equipment: work carts, hoists, turntables, overhead trolleys, etc. • Rubber lined components for highly abrasive blast media. 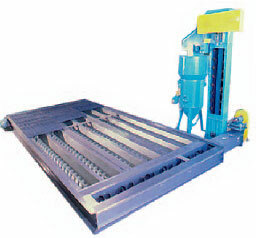 • DPS 3000 high volume dense particle separator. • Custom engineered Blast Rooms to suit your exact requirements. • Operator training and certification. • Dust collector platform & ladder. • Compressed air systems including engineering, compressors and dryers. NEVER USE WITH SAND ABRASIVE. ALL ABRASIVE BLASTING CREATES BREATHABLE PARTICLES OF DUST WHICH MAY INCLUDE SILICA AND WHICH MAY LEAD TO VARIOUS DISEASES INCLUDING SILICOSIS, A LUNG DISEASE THAT CAN BE FATAL. ABRASIVE REBOUND OR DIRECT BLAST MAY ALSO INJURE AN UNPROTECTED OPERATOR. THEREFORE, SAFETY REQUIRES THAT THOSE PERSONS IN THE AREA OF ABRASIVE BLASTING ALWAYS WEAR PROPERLY SELECTED AND MAINTAINED GOVERNMENT APPROVED RESPIRATORY EQUIPMENT AND FULL PROTECTIVE CLOTHING, FROM HEAD TO FOOT. IF YOUR PAINT OR PROCESS DUST IS HAZARDOUS, AN OPTIONAL HEPA FILTER MAY BE REQUIRED. BEFORE USING MACHINE GET APPROVAL FROM YOUR SAFETY DEPARTMENT. In accordance with our program of continued product improvement, specifications are subject to change at any time without notice.